After you have visited the above link and read the post in entirety, you will understand why I am at a loss for words. I hope to be able to expand my ability to provide you with innovative ideas and the products to achieve them, now that I have more time to dedicate exclusively to Papertrey. Thank-you to each and every one of you for being such dedicated "fans" over the last four years during my time with Paper Crafts. Susan Liles came up with this super cute idea that I just had to share with all of you! 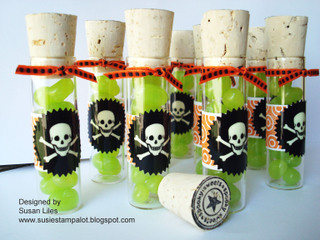 She filled these vials with Jelly Belly Lemon-Lime Jelly Beans. She discoverd that the circular star stamp from Spooky Sweets fits PERFECTLY on top of the corks! She stamped those using Noir Palette ink. I just love the way that looks! 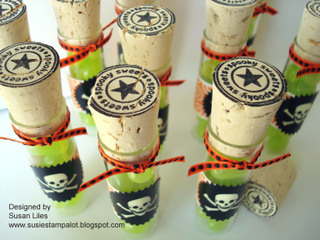 To decorate the fronts of the vials, she used the nugget label stamp, topped with a skull sticker from Martha Stewart (they even glow in the dark)! A little ribbon provided the perfect finishing detail! Thanks for sharing this FAB project, Susan! The recipients will surely be impressed! I know I was! We went to our neighbor's Annual Halloween Party this afternoon, so the kids got to wear their costumes for the first time. We took THIRTY picture total and this is the best shot we got. Ethan is actually absent from many of the shots because he mysteriously wandered off! LOL! Ethan is an adorable little chicken. 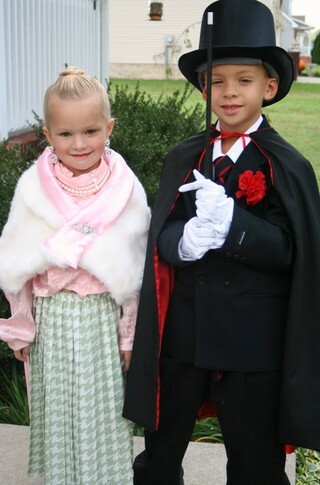 Hannah decided to be a 60's Glamour Girl and Owen a Magician. Now, I don't know about you, but when I was a kid, we never purchased costumes. We just used our creativity to transform things we already owned. It seems today that costumes are all about cartoon characters or dark gothic looks paired with cheap materials and horrible construction. And these store bought versions aren't cheap either! I decided that this year we would do it the old fashioned way! Although, much of it we didn't have around the house, it all was found in unconventional places to create a costume that they can use all year for their "make-believe" box! Owen's suit jacket I found on a clearance rack for about $10. I made the simple cape for him (it even has lettering on the back that reads "Owen the Great"! HE loved that part!) for a few dollars in materials. His wand is a wooden dowel rod painted appropriately. He has a silk carnation pinned to his lapel and the top hat was found at a party store in town. Hannah's shirt & skirt came from the clearance rack at our local Goodwill for a grand total of $3.50! I altered them a bit for size, but that's all the changes that were made to those! I made the fur stole for her and contributed some of my own costume jewelry to the cause. 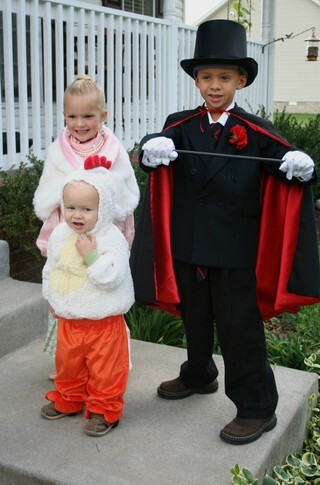 They both LOVED their costumes and I am sure they will get a lot of wear out of them in the future as well! Did you do anything fun this weekend to celebrate Halloween? I would love to hear about it! The most heartfelt thank-you to each and every one of you that has shown me support after my last post. I would never stop doing what I love because of the actions of one person. Your response was overwhelming and I appreciate you taking the time to share your thoughts on the subject with me. Huge cyber hugs to you all! First, I want to thank EVERYONE for all your comments about my television appearance that I spoke about in yesterday's post. It was very reassuring to read through all of them and made me feel at ease about the whole thing! I was really hesitant to even post a link after a few of you had requested it! So thanks for all your support. It is one of my favorite things about this industry, a benefit that I wasn't expecting. Hugs to each and every one of you! Speaking of "the industry", I had an issue come to light today that I would like to take a moment to talk about. I don't normally do this sort of thing on my blog, but I really feel the need to share my feelings on the subject. And that subject would be creative copyrights. A particular web-store took it upon themselves to blatantly steal a photograph of one of my nugget tin projects from this blog and use it to sell the tins themselves. Not only did this anger me, but it also hurt me beyond words. Anyone that has a creative bone in their body knows the feeling of accomplishment and ownership when they complete a project, or even a concept that they are proud of. To have this project taken without permission and used for someone else's financial gain is one of the most intentionally hurtful acts that anyone has ever committed towards me. I think one of the reasons that it upsets me so much is that I work so hard to make this place an open, inspiring creative space. Where people can come to learn new things, explore techniques & concepts. The time I commit to providing this type of environment is enormous, yet very important to me. There is no charge to enter here and gain new ideas. You do not need to pay to have a library of tutorials available whenever you need a creative jump start. Everything is provided purely for the LOVE & PASSION I have for this craft. The ink, the stamps, the paper. I want everyone to feel like THEY can do this. Even if they haven't stamped before, I want this to be a place where they feel everything is doable. I want everyone in the WORLD to know and feel the joy that comes from creating something with their own two hands. The feeling of delight you get when you lift that block from the paper and see a beautifully stamped image left behind. These are all the reasons why I share everything I do. The things I have talked about here today, not only apply to my personal space that I have created here for you to visit, but also to the many creative outlets that are available all over the internet today. Use them wisely. Be respectful. And make wise choices. Don't use somebody else's work for your own personal financial gain. Instead, use the artwork as an inspiration; a tool to help you build upon your own creativity. That's what ALL of us share our artwork with others for, so use the resource as it was originally intended. Thanks for considering my opinion today. I appreciate all of your support so much. It is because of you that I continue finding inspiration for new stamp designs and project concepts. Thanks for being a part of this little hobby we call stamping!